Leicester Mercury from thisisleicestershire.co.uk: the Tolkien Society is currently holding festivities at Loughborough University to celebrate the 75th anniversary of the first publishing of The Hobbit . The one-off, five-day event — The Return of the Ring — features talks, story-telling sessions, and for a massive exhibition of art inspired by JRR Tolkien‘s works. There will also be a Hobbit-style banquet, a metre-wide sponge cake in the shape of a dragon, lessons in writing names in Elvish, costumed masquerades and recreations of classic Tolkien scenes. “We want people who like the books to come and have a bit of fun,” said Shaun Gunner, trustee of the Tolkien Society and deputy chairman of the event. 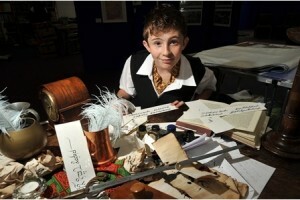 Tolkien’s grandson, Michael, will also make a rare appearance. He will read out some stories of his own and take questions from the audience.